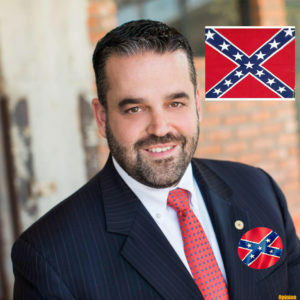 Councilman Adam McGough with links to the Confederacy we are told made a failed attempt voting to keep the Confederate monument. ack and Hispanic we are told. There are others in the group who are also seeking to keep McGough as the councilman in the 10th District to advance their agenda. Civic leaders who served on the city’s Confederate monuments task force — including rights activist John Fullinwider and CitySquare’s Gerald Britt — said it was past time to bring the monument down. “There comes a time when a generation declares enough is enough, and this is the time,” Britt said. “We will never be free … until we free ourselves from this prison of white racism,” he said. According to the Dallas Morning News. In 2017 McGough admitted on the city council that the monuments are racist and “oppressive,” yet after consulting with his confederated supporters, including Susan Fountain we are told, he voted against the wishes of the Black community and its leadership, including all but one of his council colleagues. The same group that pushed him for the youth curfew after the community stated it was targeting minorities and is racist. The groups reportedly said, “the did not want to see any “Blacks” walking around their neighborhood at night. Before the vote, McGough lobbied several Black leaders to attend his kick-off campaign to support him. No word on their reaction since he voted for the Confederate War Memorial and the alleged “racist” curfew. Previous PostPrevious IF YOU VOTE MCGOUGH BACK IN YOU WILL BE SORRY, MORE CRIME, MORE TAXES, MORE BUSINESSES AND FAMILY LEAVING.